North Korean state TV is reported to have removed footage of Jang Sung-taek – Kim Jong-un’s uncle and key aide – from a documentary, following reports that he has been dismissed. South Korean news agency Yonhap said the original film about Kim Jong-un had already been broadcast nine times. But when it aired again on Saturday, images of his uncle Jang Sung-taek, had been edited out, Yonhap reports. On Tuesday South Korean intelligence said Jang Sung-taek, 67, had been removed. 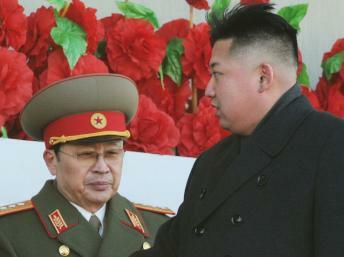 Jang Sung-taek had held senior posts in the ruling communist Korean Workers’ Party and the National Defense Commission, North Korea’s top military body. Intelligence officials also said two of his close aides appeared to have been executed for corruption. The National Intelligence Service (NIS) said it has made the assessment based on information provided by multiple sources. If confirmed, Jang Sung-taek’s removal would be the biggest upheaval in North Korea’s leadership since Kim Jong-un succeeded his father, analysts say. Kim Jong-un took over after Kim Jong-il died in 2011. Jang Sung-taek is married to the elder sister of Kim Jong-il. He has often been pictured beside Kim Jong-un and was seen by some observers as the power behind the throne. Despite his family ties to the leadership and senior status, Jang Sung-taek has been targeted by purges in the past. In 2004, despite his place in the Kim family, Jang Sung-taek disappeared from public view. One report at the time, citing South Korean intelligence, said Jang Sung-taek had been placed under house arrest. Other reports suggested Jang Sung-taek had been sent for “re-education”. However, two years later Jang Sung-taek appeared to have been reinstated.